Place beef in 5- to 6-quart Dutch oven; sprinkle with salt. Add enough water to cover beef. Heat to boiling; reduce heat to medium. Cover; simmer 2 hours or until beef is tender (add more water if needed after 1 hour). Meanwhile, in 3-quart saucepan, stir together remaining ingredients except buns. Heat to boiling; reduce heat to low. Simmer uncovered 1 hour, stirring occasionally. Place beef on plate or cutting board; let stand 10 minutes. 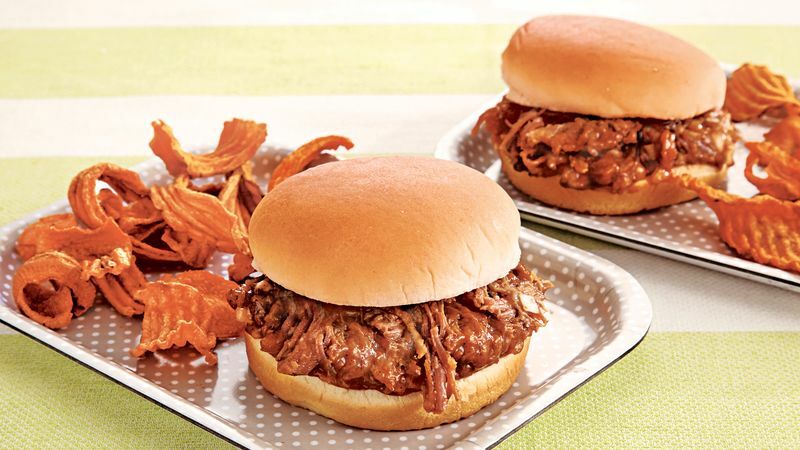 Shred or slice beef; serve on buns with barbecue sauce. To Freeze: Place shredded or sliced beef in freezer container; pour cooled barbecue sauce over beef. Cover; freeze up to 1 month. Thaw in refrigerator overnight. To reheat, transfer to 13x9-inch baking dish. Cover; bake at 350°F for 30 minutes.